HAVE YOURSELF A MUSICAL MERRY CHRISTMAS! Think on this. What if you could have two superb musicians invited to your house to sing and play Christmas songs for you and yours? Crystalline vocals, a guitar genius, lush harmonies, a bit of flute…. Brilliant, eh? 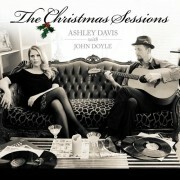 Well, if you would like to have Ashley Davis and John Doyle put you in the Christmas spirit, “The Christmas Sessions” is being released on December 1st, through Ashley’s “daisyrings” label. The beauty of this release is that it is deceptively simple, which makes for easy listening—again and again. Its as if Ashley and John are settled in your sitting room, playing and singing away without any embellishments or trappings. It takes a superb singer and an equally superb musician to pull this off. Which is why most artists can’t resist “tarting up” an album to fill up all the space. This is bare bones and beautiful and the songs are the stars. Ashley says, “These songs are so beautiful, they really only needed me to be the vessel that carries them to the listener. Though I have to say that unlike any other album I’ve put out, I had to really practice these songs because they were vocally more challenging than what I do these days. It was a great experience though, because it brought me back to that area of my voice that I used so much as a teenager singing country music growing up in Kansas. John has naturally beautiful taste in his arrangements and playing, he also believes that you have to give the song space to breathe. I think with those two approaches combined, you get a really lovely approach that yields a spacious album”. John Doyle adds, “It’s quite an intimate album. We decided at its conception of that we wanted a classic sound but with only what was necessary instrumentally, so the vocals and melody would really stand out. Yet, because we took great care in the making of it, the whole CD sounds very full and lush. Also, we chose the songs that meant the most to each of us, as memories from childhood or because of their striking musicality”. A generous helping of Christmas cheer, with 13 tracks, you will find the familiar as well as the two original pieces from Davis and Doyle. In fact, the first track, “Light My Tree” is a saucy and romantic little number inviting a special “someone” to come over and help “light my tree”. This is one of my favorite songs I’ve ever written”, says Ashley. I wanted to write a 40s big band type song that was very tongue and cheek. One day on a plane coming home last spring that line “light my tree” came into my head and I began writing it there on the plane from the perspective of the pouting girl at home trying to get her boyfriend to come over. The guitar intro to “Let it Snow” has great rhythm and bounce, which lifts the song. Davis’ vocals on “White Christmas” are spectacular, and because it is unadorned, any imperfection would jump right out at you. But of course, it is perfection. Doyle’s harmony on the second verse is understated and adds just the right amount of body to linger in your mind as you silently sing along with them. “I’ll Be Home For Christmas” has such longing and ache to it, you’ll nearly be in tears by the end. Joe Carroll’s piano accompaniment gives it a real sort of 40’s vintage treatment. In fact it is very reminiscent of a torch singer style, and Ashley says that is what she was aiming for. “I think that John and I are a really interesting yet very compatible combination with each of us bringing our own musical tastes and traits to this sonic banquet. Hearing John approach Christmas songs he’s never played and yet making them sound like he’s played his whole life is really beautiful. Then adding my voice to it, but with me approaching the songs more like a torch singer and less a Celtic one. Back to my days of singing a lot of Patsy Cline. That said, there is a definite Irish legitimacy to both “The Wexford Carol” with Mike McGoldrick on flute, and John’s original song, “Merry Christmas To All and Goodnight”. Ashley explains that this album is really composed of 13 “moments”: When I was a kid, I could not wait for the ban on Christmas music to be lifted on December 1st. My father kept all of the Christmas music on the highest shelf in the living room where I couldn’t get to it as a little girl. So when I was choosing the material for this album, I thought back on which of those songs, those moments meant the most to me. 10 of the tracks are those moments, 1 is a Doyle family moment (Wexford Carol) and then 2 originals from John and myself to make 13 new moments! The 30th Annual Winter Solabration! It’s hard to believe that this will be 30 years! And we’re still doing it! The Winter Solabration is a celebration of the Winter Solstice in music and dance. The dance consists of traditional American community dances Ð contras, squares, and a few circle and couple dances Ð all carefully taught and walked through so that all can participate. Guests also participate by bringing a potluck snack or dessert to share. At the beginning of the evening there is wassail and community singing for everyone, followed by Bryan Connolly Extreme Juggling, the Balkanika Folk Ensemble, and our wonderful storyteller, Susan Marie Frontczak. Following the Grand March there is dancing for all, with other special performances throughout the evening, including the Solstice Sword Dancers, a Mummer’s Play, the Maroon Bells Morris Dancers, and a special surprise event, as well. It all started with Karl Dise. Twenty-nine years ago, he said: “Let’s have a big Christmas feast and party and dance.” That was in 1986. It was so much fun, we decided that we should do it again next year. Then we just kept on doing it. This year will be the 30th! Things have evolved and changed some since those early years. We loved the feast, and felt that it was an important part of the event, but it soon evolved into a dessert or snack potluck. (Way easier!) We added a storyteller and a juggler when we realized that we didn’t have much for kids, and people wanted their kids to be a part of the event, too. 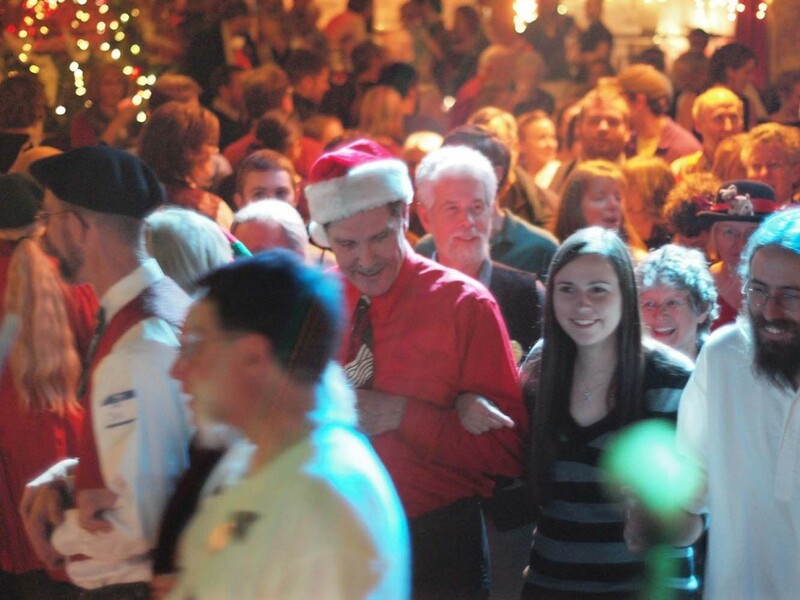 Editor’s note: Chris has been calling dances from Americana to Celtic for over 35 years. We congratulate him on his 30th Winter Solabration – a great community event! Johnny Tarr Makes Denver Debut Friday December 18 at the Irish Snug! 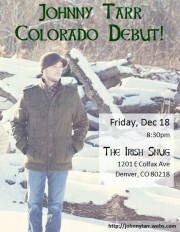 See Johnny Tarr’s Colorado Debut Friday December 18 at the Irish Snug in Denver! Originally a member of the band Sláinte, Johnny Tarr plays guitar, fiddle, mandolin, banjo, bass, harmonica, pennywhistle, bodhran, bones, bass drum, and accordion, by using loop pedals and vocal harmonizers. Johnny Tarr’s heart is in performing live music with excitement and passion for Celtic music. He will perform at the Irish Snug 1201 East Colfax at Friday December 18 8:30PM. Traditionally going on a J-1 Summer Work and Travel visa programme to the US is a rite of passage for thousands of Irish College students. Heretofore students could arrive in the US without a pre placed job and seek out employment and accommodation on arrival. From 2016 this will change to bring Ireland in line with all other countries and all students will have to have a job before being issued with a visa. SAYIT Travel, of Shandon Travel Group in Cork, Ireland are one of the two Irish companies to offer the above programme to college students and have been doing so for 20 yrs. According to Managing Director Michael Doorley, SAYIT and their sponsor InterExchange have been working hard to source suitable employers and have an offer of 40 jobs in Denver to date. Doorley said that Denver has not been a traditional destination for Irish J-1 ers to travel to and is reaching out to the Irish communities to seek help in sourcing more suitable jobs and housing. Congratulations Glendale Raptors - Back To Back Women’s Premier League Champions! Congratulations Glendale Raptors – Back To Back Women’s Premier League Champions! Glendale Raptors defeat Berkeley All Blues November 15 at Infinity Park to win second straight Women’s Premier League Rugby National Championship title. The Rocky Mountain Celts, a Celtic Orchestra conceived and organized by Mike Nile of The Indulgers and comprised of members of that band and members of, Delilah’s Revenge, Big Paddy, Celtic Friends, Angus Mohr, The McDeviants with contributions from Eric Olson and many others are on the stage at Tennyson’s Tap (4335 W. 38th Ave., Denver) on the 11th at 8 PM. $5 cover charge. 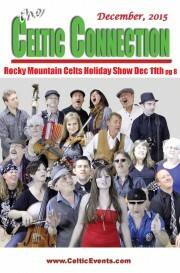 Each of the bands will perform songs alone and with each other and will perform as The Rocky Mountain Celts. The Stubby Shillelaghs are hanging up the kilts and shelving the Jameson at the end of the year. There will be one final big performance and going away party in Greeley on January 15 at the Moxi with Keep Britain Irish and a couple more bands that the Stubbies have called friends. These are their remaining shows: the 1st – Stubby Tuesday at Patrick’s Pub in Greeley, 9 PM – 12 AM, the 5th at Jack Quinn’s in Colorado Springs from 9 PM 1 AM, back to Patrick’s Pub in Greeley on the 8th , Scruffy Murphy’s in LoDo, 9 PM -1 AM. On the 15th, they will present “The Last Stubby Tuesday Ever at Patrick’s Pub” in Greeley from 9 PM to 1 AM and on the 19th it will be “The Last Stubby Show Ever” at the Big Beaver Brewery in Loveland from 7-10 PM. The Wicked Sheehogues are at the new Clancy’s Pub in Wheat Ridge on the 19th from 5 to 8 PM. Mulligan Stew, the Bennet School of Irish Dance, Eric Olson and Friends, the Celtic Friends, and Lougheed will provide the entertainment for Scotty Jodoin’s Annual Celtic Broker Hooley at the Merchandise Mart from 9 AM – 5 PM. Avourneen plays at Wee Katie’s in Denver’s Highlands Neighborhood 7 PM the 5th, 12th and 26th, at Katie Mullen’s in downtown Denver on the 16th Street Mall at 9 PM on the 4th, 11th and 18th, and on the 19th they play for a contra dance at Club Tico in Fort Collins. Dance lessons start at 8 PM. Further details can be found at: http://www.cfootmad.org/~cfootm5/calendar-node-field-date/month?date=2015-12. Adam Goldstein can be found playing late nights at Lannie’s Clocktower Cabaret at the other end of the 16th Street Mall on the 5th, 12th and 26th. Brian Clancy can be found (and seen, and heard) at the Jack Quinn Irish Alehouse and Pub in downtown Colorado Springs at 7:30 PM on the 3rd, 10th, 17th and 31st and at The Irish Snug on East Colfax on Capitol Hill in Denver at 8:30 PM on the 5th and at 9:15 PM on the 19th. The Celtic Friends will be on the air on KGNU’s Seolta Gael program at 7 PM on the 16th and on the Celtic Tavern stage for the Father Joseph P. Carrigan Division of the Ancient Order of Hibernians’ annual Irish New Year’s Eve party at 2 PM on the 31st. Colcannon presents their annual Christmas/Holiday concert on the 17th at 7:30 PM in the Rialto Theatre in Loveland and on the 20th at Nissi’s in Louisville. On the 26th, they will do a show for Boxing Day at 7 PM in the Mercury Café, 22nd and California Streets in Denver. They are also working on their next CD and hope to start fund-raising drive in the New Year. Juice O’the Barley ushers out the old year and welcomes the New Year for the Father Joseph P. Carrigan Division of the Ancient Order of Hibernians’ annual Irish New Year’s Eve party at 2 PM on the 31st in the Celtic Tavern in LoDo. The Romero Theater Troupe was recently honored by the National Education Association with the presentation of its Cesar Chavez Human and Civil rights Award. An all-volunteer “organic” community theater collective with a floating membership between 70 and 200 members ranging in age from their teens to their 90’s, the Troupe was nominated for the award by the Colorado Education Association for its work in support of the protests staged by teachers and students in Jefferson County in 2014. Thomas Wolfe is noted for observing that “You can’t go home again.” This is a story about how sometimes you can go home again and about a unique Celtic music undertaking. Mike Nile grew up in Colorado, moved to California in the late 70’s and lived in Malibu until the early 90’s. There, he a band called “Nile” and built a recording studio in the canyons of Malibu called “Nileland”, one of the only public studios in Malibu at that time. In it, he recorded artists like Mick Fleetwood, Dave Mason, Little Feat and Jan & Dean – country, rock, pop, even disco for Georgio Moroder. As the studio was taking off and he was spending most of his time recording and producing, he decided to let his band go to concentrate on studio production. But then he met ex-Camel keyboardist Pete Bardens through Mick Fleetwood and ended up touring with Pete Bardens and Mick playing bass in the Speed of Light Band. An old friend, guitarist Randy California from the band Spirit, had signed a deal with IRS Records for a new Spirit record and asked him to engineer and play some bass. Randy and drummer Ed Cassidy came into Nileland and recorded the Sprit album “Rapture in the Chambers”. When the album was finished Randy asked him if he would be interested in joining Spirit. He joined the band for an initial 5 week tour to see how it would go and ended up playing bass, singing and writing songs with the band for a little over 9 years. With a young family at home, he started finding it harder to be out on the road 150 days a year with Spirit. His engineer and producing partner at Nileland Studios, Neale Heywood had started playing guitar with Lindsey Buckingham of Fleetwood Mac and had been asked to join Fleetwood Mac as guitarist so in 1993, he decided it was time to close Nileland Studios and move his family and studio to Colorado. In Denver he opened a recording studio and record label with Dave Fox and Chris Cardone called Alley Recording Studios where he produced and engineered many talented Denver musicians. One of them was a vocalist from Dublin named Damien McCarron. 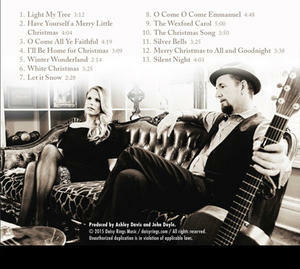 Mike engineered, produced and played bass on Damien’s debut CD “Damien Promise – A Matter of Indulgence”. On the CD Damien called all the musicians who had recorded on the CD “The Indulgers”. In 1998 Fado Irish Pub was built next to Coors Field and Damien was asked if he was interested in being the “house” band. He called and asked Mike if he would join The Indulgers – and so he did, with the understanding that he could play whatever instrument I wanted to play – guitar, mandolin, whistle and accordion – he just didn’t want to play bass. The Indulgers played every Wednesday night at Fado Irish Pub for four years. The band was not interested in being just an Irish cover band and from the beginning wrote their own music. Their first song, “In Like Flynn” won best Celtic song of the year at Just Plain Folks. The Indulgers have toured all over America and Ireland for seventeen years, playing pubs, city concerts, and festivals from San Francisco to New York City, including a six year stint in Las Vegas at the Summerlin Resort and The Orleans. The Indulgers are currently recording and filming their new song “Right As Rain” for a St. Patrick’s Day release at Mike’s new recording studio, Grapevine Studios in Wheat Ridge. The idea for formation of the Rocky Mountain Celts came to Mike in the fall of 2014 when he wrote a Christmas song called “Christmas Lullaby” that did not quite fit The Indulgers style. In his head, he heard a larger “Celtic orchestra” sound, and the thought of putting together an orchestra comprised of different local Celtic musicians and vocalists instead of multi-tracking it in the studio was intriguing. He wanted to record “Christmas Lullaby” and then shoot a video that could be released on YouTube for the holidays. He had met Karen Lauffer and Justin Lancaster from Delilah’s Revenge and Sean Gaughan from Big Paddy when they played festivals together, but knew them only in passing. He invited them to come to Grapevine Studios and listen to his new Christmas song and talk about possibly recording and shooting a video together. After meeting and talking, all agreed to work on the song and video. Karen played a rough recording he had of the song to one of her musical partners who played the harp who agreed to play on the song. He called this writer and asked me if my vocal group, the Celtic Friends would be interested in singing on the song and if I knew of any other Celtic bands and musicians that might be interested in participating in the project. I made suggestions and he contacted several different Celtic musicians, some wishing they could participate, but just not having the time, while others musicians came from as far as Colorado Springs to record the song. In all, 23 Celtic musicians performed on the first Rocky Mountain Celts song/video “Christmas Lullaby” The Rocky Mountain Celts now had an amazing string section with three violins, cello, and upright bass. There were four guitars, mandolin, accordion, and nine vocalists. He chose Red Rocks Amphitheatre, easily one of the premier performance stages in the country and recognized all over the world as the staging for the video. “Christmas Lullaby” was released on YouTube (https://www.youtube.com/watch?v=aLdhdWq3Q4o.) in time for Christmas on December 14, 2014 to a pleasantly strong reception. Such was the interest, that Mike was asked if the orchestra was available to perform, and what might be next for the group. At that point, he did not know what was next. It had been fun recording the song, shooting the video and getting to know each musician and the different bands, but it had been a big undertaking, and he had not thought about taking it further as he was busy shooting a video with The Indulgers. Phone calls and emails about the Rocky Mountain Celts kept coming, so when he finished the Indulgers video, he decided it was worth getting the Rocky Mountain Celts back together for another song and video and see if the first chemistry on the video and musical interaction between the different musicians could still work. “Rocky Mountain Snow” was recorded and released on March 14, 2015 just in time for St. Patrick’s Day (https://www.youtube.com/watch?v=DKvTibRnF40). The song featured the same musician lineup with a few new members from The McDeviants and Angus Mohr. The video was shot at various ski resorts, capturing some nice rides down the mountains, while showing the musicians performing the song in the studio. It was once again a great experience bringing everyone together. The thought of putting together a live Rocky Mountain Celts show started to become a reality, and after a few meetings, ideas for a “theatrical” Rocky Mountain Celts show started to develop – a show featuring a piper, dancers, drums, and music from all the various local Celtic bands that comprised the Rocky Mountain Celts. The strong reaction to the 2nd video inspired Mike to write a song and shoot a film for the Rocky Mountain Celts that would follow the story line of the song and feature young actors, a dancer, a castle and motorcycles. That song and video “Wild Gypsy Rover” were released October 22, 2015 (https://www.youtube.com/watch?v=y17CqztRqWE ). David Potter, banjo player and newest member of The Indulgers had this to say: “One of my favorite parts of working with the Rocky Mountain Celts has been being surrounded by some of the best musicians in Colorado. Mike has done a fantastic job putting together some top notch, professional musicians and groups for this project that is producing, recording, and engineering some of the best music in Colorado. Everyone has their part, whether big or small. Everyone adds their own “seasoning” into the mix. All of the parts come together to create a “Celtic Orchestra” that creates a new experience and energy for the audience. Jorge Agustín Nicolás Ruiz de Santayana y Borrás, better known as George Santayana, was a 19th Century Spanish philosopher, best known for his observation that “Those who do not remember the past are condemned to repeat it.” Usually a cautionary admonition, Dublin-born Christina Noble has turned the saying on its head by not only remembering her past but using what she learned from it to recognize in children in Viet Nam and Mongolia the problems she encountered as a semi-orphaned street kid in Dublin to make their lives better. On a bright, sunny November afternoon, Lindsey and Donal Grogan opened their lovely Centennial Home to an international gathering of Denverites with roots ranging from Ireland to Japan to Mongolia to Viet Nam to meet Christina and hear her story. There were County jerseys from Dublin, Donegal, Mayo, Cavan, Down, Kildare and Galway and the lively chatter in the accents from those counties and the Asian countries made a merry sound. When Christina spoke, the chatter hushed and all eyes and ears were on her as she told her tale of growing up on the poor side of Dublin in the area around the Guinness Brewery at St. James Gate known as the Liberties. Her mother, a Byrne from Carrick-on-Shannon in Leitrim, had come to Dublin to go to school and met her father, then a police cadet at a bust stop. She lost her mother when she was ten years old and became mother for her siblings as her father, who had been a boxer, had likely suffered concussions from his fights and had taken to the drink. She told of how she had supported the family by gathering twigs and wrapping them with bands cut from old nylons she scavenged from a flea market stall, loading them into an old pram with only three wheels that she’d rescued from a rubbish heap and then selling them as fire-starters. She spoke of going down to Dublin Bay and gathering winkles and whelks, boiling them, putting them into cones made from old newspapers and selling them on the streets. She talked of gathering shamrocks and tying them into bundles held together with thread and selling them outside churches. And she reminisced with great fondness of the times when her mother would take her to the cinema to see American films and how she had fallen in love with Doris Day and the songs she sang and the singing and dancing of Fred Astaire and Gene Kelly and the belting style of Sophie Tucker and how she learned the words and music to all their songs and would go into pubs and sing and dance for the money that people would throw at her feet. And she also told of how she and her siblings had been placed in foster care with each having been told that the others had died and at one point having lived in a hole in the ground beneath a bush behind a wall under the shadow of the Wellington Monument in Phoenix Park in Dublin and how she covered herself with cardboard and dark cloth to become invisible at night and how she washed her knickers at a tap in the backyard of a tenement and how she had been gang-raped, become pregnant and had her baby son taken away from her and given up for adoption. All of this she told very matter-of-factly and with a certain wistfulness for it all – and in spite of how he had treated her, spoke with love and affection for the father who had abandoned his family and for the husband who had beat her and openly cheated on her and the other husband who couldn’t/wouldn’t grow up. She shared the story of a recurring dream she had in which children on the streets of Viet Nam were calling to her and how she spoke with her three children and got their permission to finally answer the call of that dream and go to Viet Nam with only a little money, no Vietnamese language skills and a lot of mother’s love in her heart and compassion for children on the street as she had been. Unable to say her name, the children she helped there settled on “Mama Tina” as she cared for them and created havens from the streets for them in places that she refuses to call orphanages and instead asks that they be spoken of as Safe Houses or birds’ nests. Children with birth defects from the long-term after effects of the Agent Orange dropped on the forests of Viet Nam still abound there and the systems don’t exist to provide for their care as she does. In the 25 years since she began her work, over 700,000 children and disadvantaged people have been helped by her efforts. She accepts no government funds of any kind in order to maintain her independence and is very careful to avoid saying anything bad about any of the governments she has worked with in providing care around the world – in addition to Viet Nam and Mongolia, she has also provided humanitarian aid in Cyprus, Syria and Lebanon. She spends much of her time today raising money and often visits pubs and other ex-pat watering holes in the places where her birds’ nests are with the children who live there and who she has taught to sing songs like Abba’s “I Have a Dream” and “The Fields of Athenry”, just as she once did for funds in the pubs of Dublin. Blessed with the Irish wit and charm and memory, she recited a bit of Yeats “Isle of Inishfree” and sang “I Have a Dream” and “Fields of Athenry” for the crowd at the Grogan’s and charmed them into donating over $11,000 to her foundation which was very generously matched by Donal Grogan’s company, Argon Masking Corp. If you would learn more about Mama Tina, her life, her work and her foundation, start with the website for the Christina Noble Children’s Foundation www.cncf.org and then read her books, “Nobody’s Child” and “Bridge Across My Sorrows” or see the 2015 movie about her life that’s simply called “Noble.” And after you’ve done all that, dig deep and help Mama Tina help others. 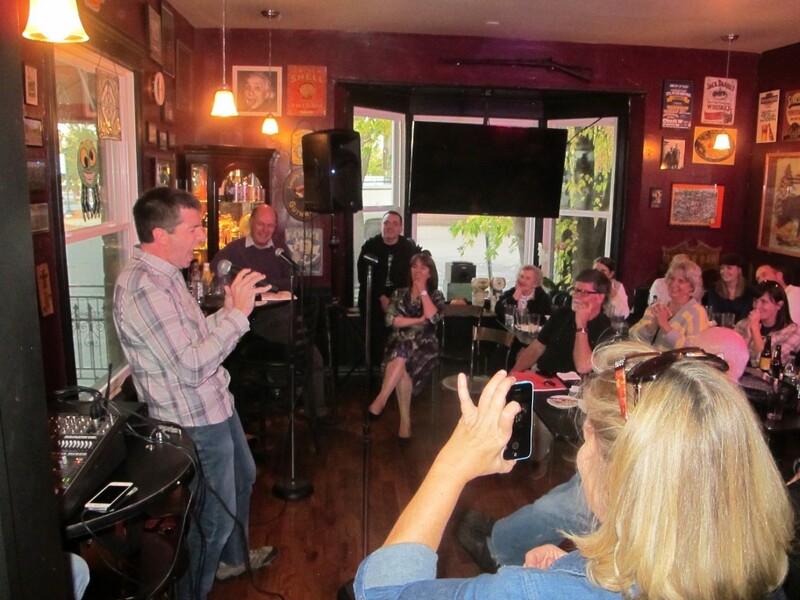 Denver Irish Network Musical Afternoon - "Sure the craic was 90"
Clancy’s Irish Pub proved to be the ideal venue for the recent ‘teacht le chéile’ (get-together) of the Denver Irish Network on November 1st 2015. Leading the entertainment for the afternoon were Seamus Blaney’s sister and her husband (Carol and Paul McAlister) whose program included singing, storytelling and recitation. Traditional songs such as ‘Belfast Mill’ and ‘The Pretty Maid Milking Her Cow’ were complemented by singing in Irish, ‘Fear an Bháta’, more recent songs ‘Antrim Coast Road’ and ‘Nancy Spain’ and recitation, ‘The Papist and the Prod’. The afternoon program was greatly enhanced by impromptu contributions from: Alan Groarke, Emily Dawson, Lisa Switzer, Dennis Gallagher, Mary Ryan, Brian McCarthy, Shay Dunn and Damien McCarron. These additional contributions included the recitation of Yeats’ poetry and singing accompanied and unaccompanied in English and in Irish. Of particular note was the singing of Alan Groarke who ‘tipped the scales towards Munster’ with some rousing songs from Cork and Kerry. The appetisers provided by the Irish Network were greatly appreciated by the large crowd that attended. At the close of the entertainment, Maura Clare thanked the entertainers and Shay Dunn who set up and managed the sound equipment for the afternoon. Go dtí an chéad lá eile! – until the next day! Kindred Spirits is one of Denver’s oldest music groups and plays some of the world’s oldest music. The group will present their 6th annual winter concert in the Tuft Theater at Swallow Hill Music in Denver on Saturday, December 5th at 8 PM. Comprised of four remarkably versatile and talented musicians who feature a repertoire of Renaissance, Celtic and folk tunes of the old world, they play the Celtic harp, cello, flute, viola, violin, guitar, accordion, piccolo, hammered dulcimer, marimba and bass. The concert, entitled “Winter Radiance”, will feature winter-themed material that they refer to as the “Greatest Hits of the 16th Century” (or any century from the 11th to 18th, as this is the period from which most of their pieces are drawn). Guest artists at this year’s concert will include Eric Olson on Uilleann pipes and whistles, James Messerich on djembe, bodhrán and misc. percussion and John Hubert on voice and guitar. Meet 2016 Denver Queen Colleen, Kate Kelly! On October 25th at the Celtic Tavern, the Denver St. Patrick’s Day Parade Committee crowned Kate Kelly its Queen Colleen for the 2016 Parade. Maureen McGinty, 2015 Queen Colleen, passed her crown to Kate, a Colorado native and graduate of Littleton High School and the University of Denver. Jay Leasure, President of the Parade Committee introduced his Board, welcomed the crowd gathered for the coronation ceremony and MC Mike Foley managed the event that featured entertainment by the Michael Collins Pipes and Drums, Celtic Steps and Celtic Friends. The daughter of George and Maureen Kelly of Littleon, Kate is 25 years old and has family roots in Counties Cork and Mayo. At the University of Denver she majored in International Business, spent a year studying at University College Dublin and graduated with honors from DU. Along with several hundred others, she was invited to apply at UCD for a special graduate program and flew to Dublin for an interview. She was one of the top ten finalists but needed to finish in the top five so didn’t receive the study fellowship this year and intends to apply again next year. 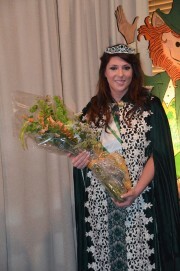 A member of the Irish Network Colorado Board of Directors, she was sponsored by INCO for the Queen Colleen competition. In her acceptance speech, she spoke of the honor it is to be given the crown as a literal and figurative symbol of her lifelong love of her Irish heritage, Irish culture and history. She said that she is passionate about community involvement and wants to use her role as a vehicle to bring heightened awareness of that culture, its history, music and dance to the people of Denver and especially to the members of her own Millennial generation. She has worked at Leprino Foods for several months and will travel to Ireland with her family later this year. An equestrienne since she was ten years old, she had her own horse named Charlie for many years – and since the theme of the March 12, 2016 St. Patrick’s Day Parade has the word “stampede” in it, there may be an equine surprise in the Parade – but you’ll have to go down to the Parade to see what it will be.